The all-new Sonata 1.6 Turbo features sportier styling and more power than the standard version. Earlier this month, Hyundai lifted the wraps off the new redesigned 2020 Sonata sedan before its world debut at the 2019 New York Auto Show next month. 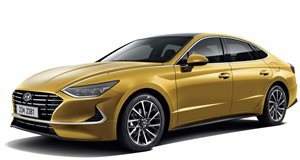 As its debut draws closer, the Korean automaker has announced a new turbocharged variant will join the 2020 Sonata lineup, which will be shown at this week’s 2019 Seoul Motor Show. Hyundai says the new turbocharged Sonata will also feature "sporty and sensuous design enhancements” to distinguish it from other models in the range. The exterior of the Sonata 1.6 Turbo is highlighted by Hyundai first ‘Parametric Jewel’ grille, air ducts positioned below the headlights that channel air through the bumper and across the face of the wheel to reduce drag, and a rear spoiler that keeps the car stable at higher speeds. It also features a unique rear bumper and twin exhaust tips. Performance details are being kept under wraps for now, but more information will be revealed, including the remaining powertrain options, when the new eight-generation Sonata debuts in New York. At the Seoul Motor Show, Hyundai will also unveil its ‘N Performance’ car, a Veloster N model equipped with many official N Performance parts and bespoke customizations. A comprehensive new range of N Performance parts will be released later this year, starting with items developed specifically for the Veloster N.
The car on display in Seoul is equipped with 45 customizable parts. These include 14 driving performance parts, including lightweight forged wheels, larger brake calipers and brake pads, a high-performance suspension system, and high-performance tires. 11 exterior style parts are also fitted, including a real carbon fiber side-skirt, diffuser and rear wing spoiler. No one said upward mobility was the answer to all your problems.